Manus Walsh the grandson of author Maurice Walsh and Irish language writer Sean O’ Kiersey was born in Dublin. 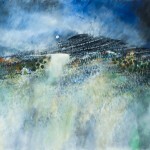 Working in the visual arts for over forty years, Walsh has created his own niche within the art world of Ireland. He has exhibited widely throughout Ireland and also in Chile, Spain and Germany. Residing in the majestic Burren in the West of Ireland for over 28years Walsh has gained inspiration in abundance from this landscape, resulting in a mystical body of work almost devoid of colour. In contrast to his works from the Burren, he has produced works from his travels to Spain, Cuba, Chile, France, Germany and Italy that are rich in colour and rhythm. Fluctuating between styles and genres depending on what inspires him at that moment, he has worked in stained glass, enamel, oils, pastels, gouache and collage. Possessing such a varied and diverse practice it is difficult to label Walsh’s work, it has been described as cubist, abstract, impressionist, surreal, naturalistic and romantic. Insurance Corporation of Ireland etc. France, Germany, Spain, Chile, USA, Canada, England, Italy, Scotland etc. This entry was posted in Artist Profile and tagged AIB, Dyehouse Gallery, Kenny Gallery, Lavitt Gallery, Office of Public Works, Project Arts Centre, RHA Exhibition, Sligo Art Gallery, The Arts Council Dublin, Wexford Arts Centre. Bookmark the permalink.